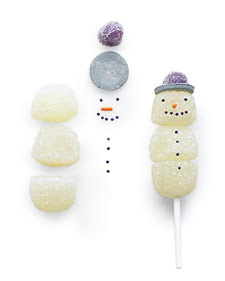 Create fun candy pops with this idea from Martha Stewart. It's great as a holiday activity or to make with your kids to give as gifts to their friends. 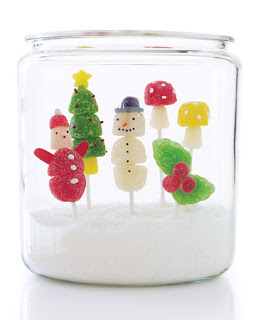 Stack gumdrops, dot them with sprinkles and other candies in creative ways, and watch the colorful confections come to life as snowmen, Santas, and other icons of the season. Wrap the candy pops in cellophane bags, and then attach them to gifts or slip them into stockings. Or create a holiday display: Partially fill a large glass jar with sanding sugar, and stand the figurines on flower frogs in the sparkling "snow." 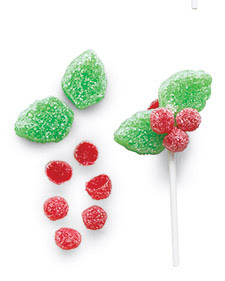 Slide gumdrops onto candy sticks to create body of each pop. For Santa: Use top half of 1 small gumdrop for hat. Trim 2 oblong candies for arms. Use candy-coated seeds for buttons and pom-pom. Poke candy where facial features will go with a skewer; use sticky tip to pick up and place nonpareils for eyes and nose. 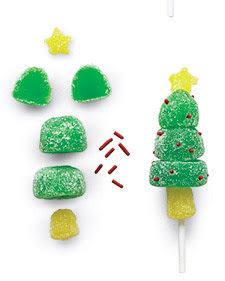 For Tree: Use 1 flattened gumdrop for base of tree. Use 1 small gumdrop for trunk. Cut sides from 1 gumdrop; press sides around top of stick, for treetop. Flatten 1 gumdrop; using an aspic cutter, cut out star. Insert sprinkles for lights. 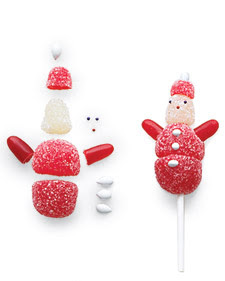 For Snowman: Trim top of head; top with 1 candy wafer and half of 1 small gumdrop for hat. Using a skewer (see "For Santa"), place nonpareils for eyes, mouth, and buttons. Insert sprinkle for nose. For Holly: Use halves of small gumdrops for berries. 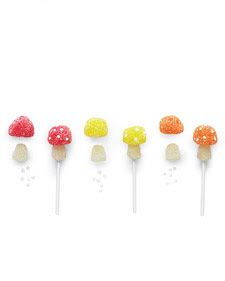 For Mushroom: Use 1 small gumdrop for stem. Use sequin sprinkles for dots.